Industry research shows that people prefer to touch as few surfaces as possible when in public restrooms. In response to this demand, Bradley offers its new Center Pull Towel/Waste Receptacle Unit (Model 236). With the Center Pull, users don't have to touch a handle, other dry towels or any other part of the dispenser to dry their hands. The unit is made of heavy-duty stainless steel, making it extremely durable. It is available in recessed and semi-recessed models, as well as a surface-mounted unit with a 12-gallon waste receptacle. The dispenser accommodates pull-towel rolls up to 9 inches in diameter. CYRO Industries offers Acrylite® RinkShield™ acrylic sheet for spectator shielding in hockey rinks and indoor arenas. Guaranteed to meet ASTM Standard F1703-96, it is full-gauge .625 inches for rink ends and .500 inches for rink sides and bench areas. Weighing 100 pounds less per pane than glass, RinkShield™ sheet offers superior impact resistance with low rigidity, reducing player complaints and injuries. RinkShield™ sheet provides clear viewing for spectators and increased safety and comfort for players. An extension of the Acrylite® GAR acrylic sheet product line, RinkShield™ sheet has an abrasion-resistant coating to reduce the appearance of scratches and marks. 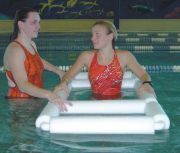 Kiefer Aquatic Parallel Bars offer physical and psychological support for patients, giving them something to hold, lean or fall on while they exercise. They also aid patients while they walk in water, allowing people to fully bear their weight without fear of going under. This extremely buoyant device floats on the surface of the water, assisting both patient and therapist. Measuring 30 inches by 60 inches with 4-inch foam, the bars are not restricted by the size or depth of your pool. The new compact Aerobic Step designed by Fitness First Products is the ultimate in body conditioning and cardio fitness. Having a unique patented design, the 16-square-inch platform comes with four risers, allowing five height adjustments, with a maximum weight capacity of 225 pounds. The High-Step is ultra sturdy with textured surface and rubber feet, offering both aerobic workouts and muscle-strengthening options, such as a Bench Seat. This revolutionary Step can be used in home, studios, rec centers and programs needing multipurpose, space-saving solutions.Discover why fitness industry professionals have selected Fitness First Products since 1987. Broyhill has two new improvements on its Load-And-Pack refuse vehicle that is known for its abilities at parks and beachfronts. The first is a new grip arm design that ensures a better grip on poly containers. The grip arms overlap and produce a seamless grip that helps support more flexible garbage containers. The second improvement is on the refuse container. The 7-cubic-yard refuse container has been upgraded with an internal garbage containment scraper that is employed when compacting the trash between trash pickups. The new Wide-Swath Dust Mop Frame Connector from Briarwood Products helps reduce cleaning time and labor costs by creating double the dusting ability. You can attach two dust mops to one handle, making the Wide-Swath Connector ideal for use on any large floor surface that needs dusting. Manufactured with tough plastic, the Connector fits any 1-inch-diameter standard threaded handle and locks into position. The dust mop frames attach to the Wide-Swath Connector, and dust mops are placed over the frames. The Connector accommodates either Briarwood plastic dust mop frames with a 3/8-inch-diameter connector bar or standard wire frames. The newest product from Leisure Activities is its Inflatable Haunted Maze. It's not only entertainment for the whole family, but a money-maker as well. The family-friendly inflatable Haunted House is easy to set up and compact to store. If you have the right location and adequate parking, the unit can generate thousands of dollars per day. In general, inflatables are a great income subsidy, and the Haunted House in particular lends itself well to park settings. The outdoor environment creates a natural setting for the attraction. Duraline®, a leading manufacturer of lighting streamers and other electrical power distribution systems for more than 50 years, offers the new Enviro-Light 753 Vapor-Proof Lighting Streamer. The Enviro-Light 753 delivers reliable illumination for a wide range of worksites and features a watertight construction that eliminates problems associated with oil, moisture and water. The unit can be surface-mounted at any angle using the four mounting holes provided on each block. The vapor-proof blocks are integrally molded in solid Hypalon rubber and have heavy-duty cast aluminum guards for maximum impact protection. Pyrex globes screw into each block and form a vapor-tight seal.